Dr. K Eric Sommers is committed to the appropriate utilization of minimally invasive and innovative techniques to improve the care of thoracic surgery patients. Robotic assisted and Video assisted approaches are now commonly used to perform operations that formerly required large incisions or openings in the chest to complete. 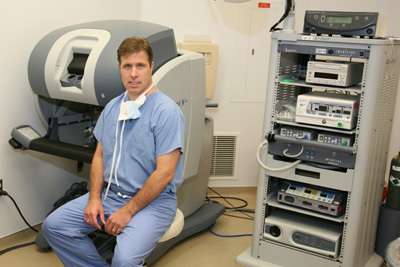 Dr. Sommers has the most extensive experience in robotic assisted thoracic surgery in the region. During your consultation, he will carefully review your case to see if minimally invasive techniques can be used in your situation. In addition to minimally invasive approaches, Dr. Sommers also takes advantage of other leading edge techniques to ensure that your operation will be as safe and uncomplicated as possible. We are constantly striving to improve outcomes for our patients and the incorporation of new techniques and technology helps us to ensure a successful outcome in the vast majority of cases.